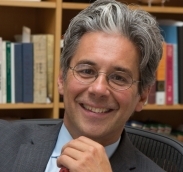 Chase F. Robinson, currently president of The Graduate Center of the City University of New York (CUNY) and distinguished professor of history, will become the Dame Jillian Sackler Director of the Arthur M. Sackler Gallery and Freer Gallery of Art at the Smithsonian. He assumes his new position Dec. 10. Together, the two museums comprise the Smithsonian’s national Asian art museums with a total of more than 41,000 works. As director, Robinson will oversee 115 full-time employees and manage an annual operating budget of $23 million. A scholar of Islamic history and culture, Robinson has authored or edited nine books and more than 40 articles that span the geographical and chronological breadth of the pre- and early-modern Islamic Middle East. They include A Medieval Islamic City Reconsidered: An Interdisciplinary Approach to Samarra(2001), Texts, Documents and Artefacts: Islamic Studies in Honour of D.S. Richards (2003) and the first volume of TheNew Cambridge History of Islam (2010). A recent book, Islamic Civilization in Thirty Lives: The First 1,000 Years (2016) was translated into Arabic and Portuguese. His most recent work is The Works of Ibn Wadih al-Ya’qubi: An English Translation(2017), a co-edited, three-volume set of translations of some of the earliest works of history and geography in Arabic. The Smithsonian’s Freer Gallery of Art and the adjacent Arthur M. Sackler Gallery, located on the National Mall in Washington, D.C., together comprise the nation’s museums of Asian art. They contain some of the most important collections of Asian art in the world, featuring more than 40,000 objects ranging in time from the Neolithic to the present day, with especially fine groupings of Islamic art, Chinese jades, bronzes and paintings and the art of the ancient Near East. The Freer|Sackler also contains important masterworks from Japan, ancient Egypt, South and Southeast Asia and Korea, as well as the Freer’s noted collection of works by American artist James McNeill Whistler.